Motor Trend recently got their hands on a 2013 Ford Mustang V6 and have posted a full review and test results on their web site. The magazine praised the car’s performance capabilities, saying that “it’s evident the Mustang overachieves in almost every major objective test.” Their test car, equipped with the optional performance package, hit 60 mph in just 5.3 seconds and passed through the 1/4 mile in 13.9 seconds at 100 mph. “It can accelerate, turn, and stop quicker than most of the competition,” they went on to say. Of course, Motor Trend had a few negative comments for the 2013 Mustang V6 as well. “The steering, while linear and nicely weighted, is like a talented conductor whose orchestra is always a note behind,” they noted. On their wish list for the next generation Mustang is an independent rear suspension and a reduction in weight. “We also hope Ford’s icon finally loses its solid rear axle, since an independent setup would make the Mustang a more rewarding tool when exploring those last few tenths,” they continued. 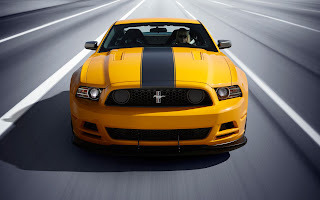 You can read Motor Trend’s full review of the 2013 Ford Mustang V6 Premium over at their web site. 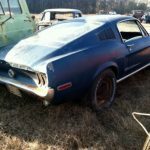 This entry was written by by MustangsDaily (Mustangs Daily) and posted here on Thursday, May 17th, 2012 at 12:41 pm and is filed under 2013 ford mustang, 2013 ford mustang v6, 2013 mustang, 2013 mustang v6, gotta have it green, motor trend, mustang v6, News. This article was not written by us, rather gathered using RSS feeds listed here. We take no credit for this article. You can leave a response, or trackback from your own site.